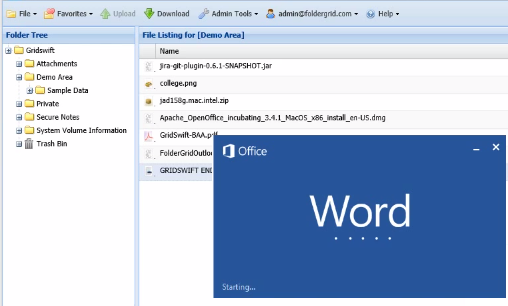 The ability to use "Open Local" from the WebApp to open a document using their locally installed applications (Word, Powerpoint, etc...) where any saves of that document will be automatically and transparently saved back to FolderGrid. This is a huge time saver versus the default where the user needs to download the doc, open it, save changes, then re-upload the new version. Freely Available for any user! Once installed, FolderSync enables the "Open Locally" option within our WebApp which will automatically open a secured file with your local editor. Any changes you make will be automatically secured on your FolderGrid domain. FolderSync also supports maintaining a local copy of your secured content for easy offline access. This feature is useful for laptops & mobile devices that may at times be disconnected from the internet. You can make changes to these local copies of secured files in your synchronized folder and your changes will be synchronized with your FolderGrid domain once internet connectivity is restored.